Today in Pride and Prejudice: Really, Darcy? REALLY? Nicely done, Fitzwilliam Darcy. A classy proposal, on all counts. You ticked off all the boxes here: insulted the lady, insulted her family, insulted her way of life--and you snuck in a few words of undying love. Well done. How on Earth could any lady resist? Let's review: You started off pretty well--shocked the lady… Continue reading Today in Pride and Prejudice: Really, Darcy? REALLY? Today in Pride and Prejudice-You Must Make Lizzy Marry Mr. Collins! Dear reader, you recognize that line, don't you? I haven't posted any Today in P&P lately...shame on me. I intend to remedy that, however. 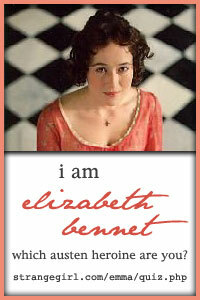 On November 27, Mr. Collins proposed to Lizzy. Prior to that, on the 20th, we were first introduced to Wickham. Oh, and Elizabeth and Mr. Darcy danced. As you can see,… Continue reading Today in Pride and Prejudice-You Must Make Lizzy Marry Mr. Collins!